Civilians, Refugees, and the 2nd Indochina War in Laos – Patrick F. Clarkin, Ph.D. Displaced Hmong in Laos, probably in the early 1970s. Source: Roger Warner. 1998. A consistent feature of war is the harming of civilian lives. The extent of harm is not always easy to ascertain, but is sometimes quantified in the number of “excess deaths” that occur during a war. For example, Hagopian et al (2013) surveyed two thousand randomly selected households throughout Iraq, interviewing residents about their family members before and during the US-led invasion and occupation. They estimated that from March 2003-2011 approximately 405,000 deaths occurred as a result of the war, mostly from violence. However, such studies always have limitations – recall bias, survivor bias (the dead cannot be interviewed), and logistics in surveying high violence areas – meaning that mortality estimates will never be perfect, and Hagopian et al. gave a range around their figure (a 95% uncertainty interval of 48,000 to 751,000 excess deaths). Whatever the exact number, which we will probably never know, we can still be confident that mortality rates increased during the war years. The same challenges apply to all wars, including one that I have been interested in for a while – the Second Indochina War in Laos. The Australian historian Martin Stuart-Fox wrote that: “loss of life can only be guessed at, but 200,000 dead and twice that number of wounded would be a conservative estimate” (1997: 144). 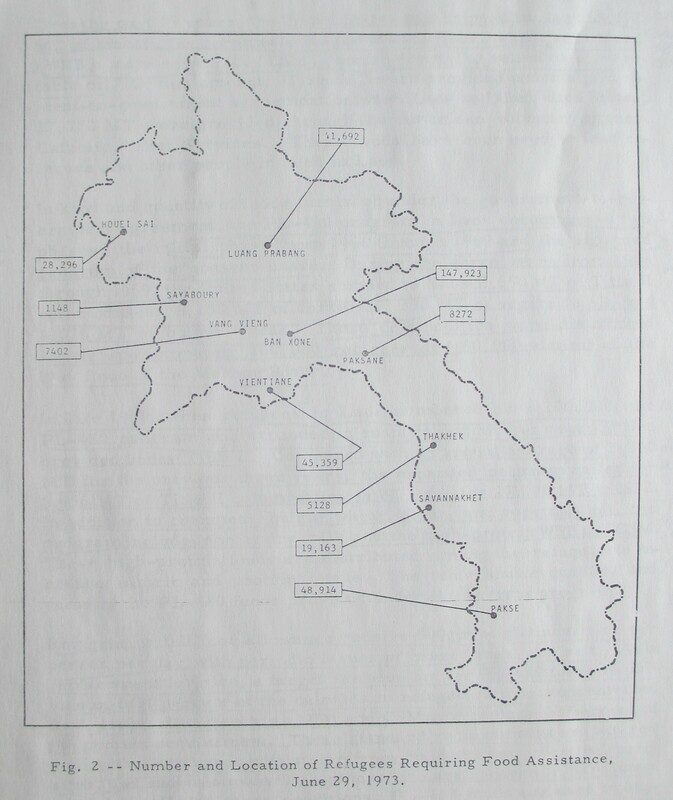 Mortality estimates for Laos are further complicated by the fact that it was one the least developed countries in Asia at the time of the war, likely with unreliable census data and other record keeping (though, for those who are interested, see the 1961 Joel Halpern “Laos Project Papers” from UCLA, which contain demographic and health statistics). “At one time or another, as many as three quarters of a million people, a quarter of the entire population, had been driven from their homes to become refugees in their own country” (p. 144). Bombing of Laos was clustered in the northeast, and in the south along the Ho Chi Minh Trail. Source: UXO Lao. The three selected quotations at the top of this essay demonstrate that the impact of the war was not geographically uniform. Laos is a country with perhaps up to 60 different ethnic groups, with clusters in different regions. All were affected by the war, but the ones that bore the brunt appeared to be in the northeastern highlands (which the US and the Royal Lao Government referred to as Military Region 2), and in the south along the Ho Chi Minh trail. This is illustrated by where American bombing of Laos was most concentrated. 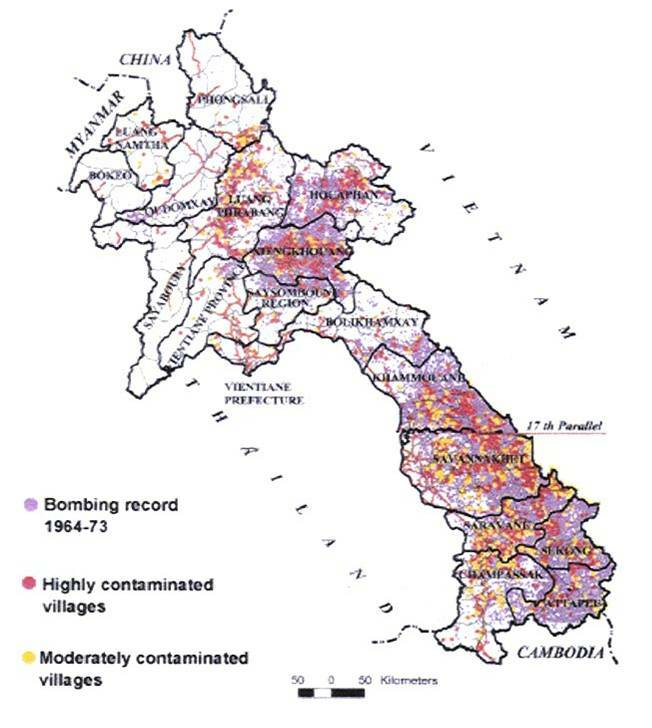 By now, the bombing figures are old hat: between 1964 and 1973, the US flew more than 580,000 documented bombing sorties over Laos, releasing more than 2 million tons of ordnance dropped over an estimated population of 2.4 million people (or 0.87 tons per person, the highest amount per capita in history). Control of the civilian population, rather than just territory, was a crucial element of the war, and relocation/evacuation by the RLG became more common after 1968. Statistics from USAID (United States Agency for International Development) documents show that the number of refugees receiving assistance remained between 100,000 and 130,000 from 1963 to 1968, jumping to over 200,000 in mid-1969, and peaking at 353,297 in June of 1973 (USAID 1973: 22-4). The role of USAID was of course not completely neutral, and civilian and military operations were very much intertwined. The Hmong general Vang Pao told one of USAID’s most important employees – an older farmer from Indiana, Edgar “Pop” Buell – “without your airlift (of food and supplies), all of my people would have starved. I can organize an army and fight, but I must have you to help the civilians. Without the support of the people my soldiers cannot live” (Schanche 1970: 85). 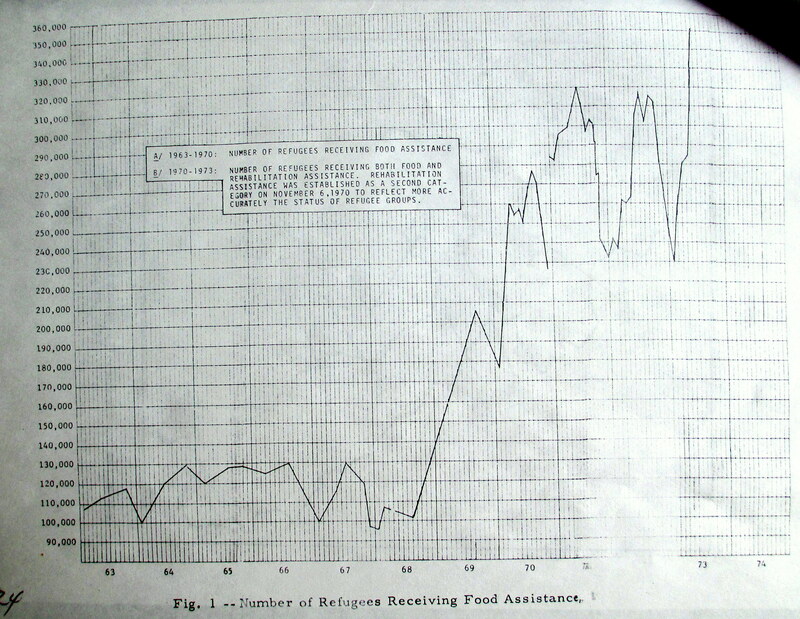 Number of refugees receiving food assistance. Source: USAID 1973. 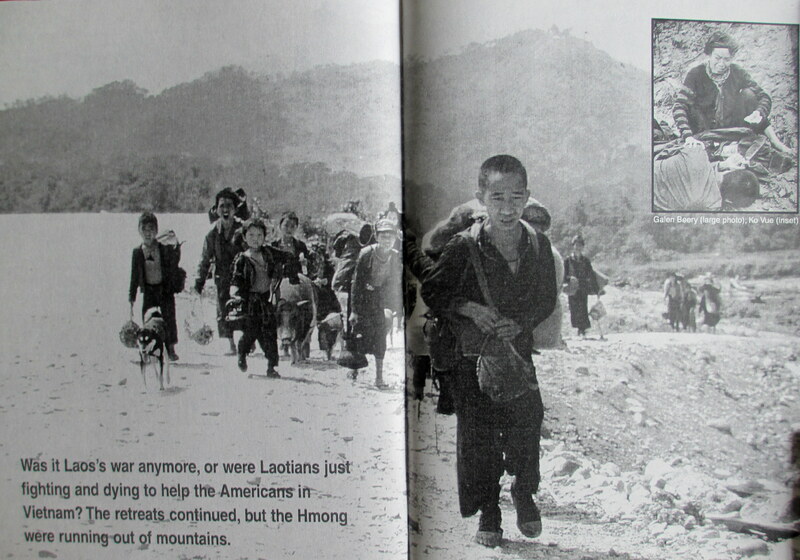 The increasing refugee population, especially those trickling from the Plain of Jars to the outskirts of Vientiane in 1968-69 drew international media attention to the war in Laos, which had remained largely invisible up to that time (Robbins 1987: 134). Attempts to lay blame for the creation of refugees was attributed to either US bombing missions or to increased aggression by leftist ground forces, including the North Vietnamese and Pathet Lao. It is probably safe to say that both sides were to blame, though the doling out of responsibility is hard to quantify. People were displaced prior to American bombing, partly by the RLG to deny Communists from new recruits, partly by Communists for similar reasons. But the distinct increase in IDP’s after 1968 coincided with diversion of US air power away from North Vietnam to Laos that same year, indicating that the lion’s share of the displaced can be attributed to the bombings and the overall escalation of the war. President Lyndon Johnson had ordered the cessation of bombing of the northern half of North Vietnam in March 1968, perhaps because of the loss of a strategic guidance system (at Phou Pha Thi), or perhaps because of upcoming peace talks in Paris (Conboy 1995: 196). Reportedly, 97% of refugees coming to Vientiane province had seen a bombing attack, while many lived in caves and holes, farming only at night after 1969 (Branfman 1972). Suffice it to say that the war in Laos was not simply a guerilla war; instead, it had escalated into a high-intensity one with many civilian casualties. One of the main factors involved in war-related morbidity and mortality in Laos was the ubiquity of forced displacement. The low population density in Laos meant that entire villages were sometimes able to find new homes in uninhabited, secure areas. However, many others were not so fortunate and wandered for days to months to find sanctuary, often in scattered locations where ecological conditions were less than favorable (US Congress 1970:16; Schanche 1970: 100; Yang 1993: 59; Kuhn 1995: 69; Weldon 1999: 52, 124-9, 151, 235; Quincy 2000: 426). According to USAID (1973: 21), some people were displaced a dozen times or more, walking tens to even hundreds of miles in total. Those displacement experiences took their toll on people’s bodies and levels of psychological stress, as they do in all wars. That seems like a perennial question. Kuhn EC. 1995. U.S. Foreign Assistance Oral History Program: Foreign Affairs Oral History Collection. Arlington, VA: Associationfor Diplomatic Studies and Training. Quincy K. 2000. Harvesting Pa Chay’s Wheat: The Hmong and America’s Secret War in Laos. Spokane, WA: Eastern Washington University Press. Robbins T. 1987. The Ravens: The Men Who Flew in America’s Secret War in Laos. New York: Crown Publishers. Schanche DA. 1970. Mister Pop. New York: McKay. USAID. 1973. Facts on Foreign Aid to Laos, July, Internal reference #: PN-ABI-555. USAID. 1976. Termination Report, January 9, Internal reference #: PN-AAX-021. Warner. R. 1998. Out of Laos: A Story of War and Exodus, Told in Photographs. Weldon C. 1999. Tragedy in Paradise: a Country Doctor at War in Laos. Bangkok: Asia Books. Yang D. 1993. Hmong at the Turning Point. Minneapolis: Worldbridge Associates. This entry was posted in Global Health, Hmong, Laos, Refugees, War and health and tagged IDPs, Internally Displaced Persons. Bookmark the permalink. Safest place anywhere is in the armed forces. Maybe the moon, or that deep cave they found in Vietnam, Son Doong. Great, now everyone knows my escape plans. Pingback: The Biology of Forced Displacement | Patrick F. Clarkin, Ph.D. I really like your Hmong ran from the mountain picture, so I would like to know if I can get one. Please let me know by my email address below. Thank you. Thank you so much for your help. I will look at those websites you gave me. By the way, I hope you won’t mind if I share something with you. I work from home as a Hmong interpreter, so I wrote a book last year 2014 with this title, “Challenges of Interpreting Between Hmong Patients and Western Medicine” by Maiv Txiab Vam Xeeb Yaj. If you have time, please go online with Amazon, Google, Ebay, Barnes and Noble, or my publisher Xlibris, and please help me order one to read and please give me your comment online for me. Again, thank you. Citing Martin Stuart Fox and Yang Dao is relevant to this subject and both are very reasonable and objective people. Yang Dao is of course the first Laotian to get a PhD (University of Paris). It is worth noting that during the coalition government of 1973-5, Dao returned to and remained in Laos, as did most people. At that time, in spite of the forced relocation prior to and during the 9 years of constant bombardment, and in spite of a civil war that had divided all Laotians of all ethnicities, there was HOPE. In 1973 the 7,000 Thai soldiers fighting on the US supported side left the country. The coalition government genuinely included all sides together in government, there were joint patrols (even in Vientiane’s streets) by soldiers belonging to armies that had previously fought each other. There were no recorded revenge massacres. Soldiers relieved of the need to kill each other set to work to help farmers get food production back on track. At the time (I met Dao in 1973-5 in Vientiane and he was involved in some of the nascent reconstruction projects) there was every hope that things were working and that a working system was being recreated by Laotians. This, I think is worth reflection. Had Laos been an independent island in a large sea, there is a possibility a peaceful path of development beneficial to all would have been followed. But no man and no country can exist in isolation for long. The lesson is that even in the nastiest situation opportunities occur, or can be made, to reverse hostility, forgive but not forget, and cooperate in a win-win future. That this opportunity was not welcomed by all and was sabotaged by some is another lesson. Thanks, Robert. It’s been a while since I read about that period of history in Laos, so my memory on it is hazy. I vaguely recall that period of time, when there was goodwill and a look toward a hopeful future. My mind also jumps to a few years later, when fighting began in the northeast between the government and guerrilla factions which then continued on for years. Like I mentioned yesterday to you, I really liked these Hmong ran from the mountain picture a lot. Do you know where or how can I get them? Please let me know. Thank you. You are not the only one, Patrick, whose memory of that period is hazy. While I was here quite a bit during those two years, and came back in 1980, so much affects memory. I do not blame those who were not born at the time for not knowing about the coalition government. Those who do have usually gained their knowledge from sources which were not around or which have a political agenda. Periods of comparative peace just don’t make the news. Ignorance of the period is as great here in Laos among young Lao (i.e. most people alive) as it is in the US, where 18 months (officially two years) of peaceful coexistence is drummed out of any collective memory by myth and propaganda, or by books written by Americans who flew at 52,000 feet. Mai Chia. I must seek out your book. After leaving Laos in 1984 and after a time in Geneva and Africa, I returned in 1989 and lived 4 years in Chiang Kham, on the border of Saynyabouli, as UN officer in charge of Highland Refugee camps. MSF was the medical authority in all camps. They did excellent work but their doctors were young and French and each stayed just six months. There were Yao, Akha, Htin etc as well as Hmong, so the common language was Thai (not Lao). Interpreters were mostly drawn from young Thais. The situation was of ‘montagnards’ who spoke no French or Thai or English explaining their medical problem in Lao, perhaps through a refugee interpreter from mother tongue, to young French, who spoke none of the languages in any camp, in English (a language most French spoke badly). Still, the situation was a million times better than the medical scene in Laos of that time. Pingback: 40 Years After the Second Indochina War | Patrick F. Clarkin, Ph.D.